As a man-made product that originates with petroleum, polyester doesn't breathe as well as cotton -- or wick moisture as efficiently -- which makes cotton a superior bedding material if you get too hot at night when you're sleeping. As a naturally grown fiber, you can buy cotton as an organic bedding product, but it may shrink when washed and wrinkles much easier than polyester. Cotton also don't have the resistance to fading that polyester does. A young woman lying on bed. 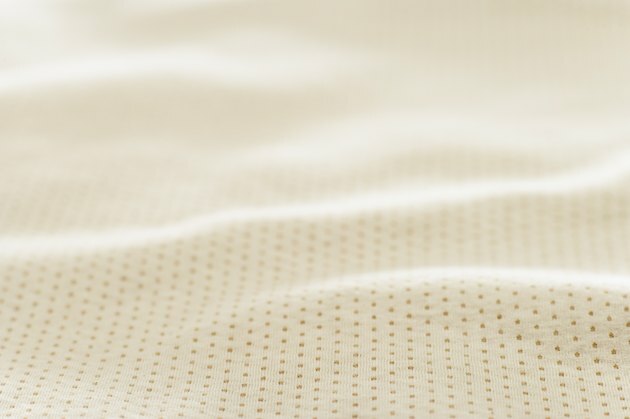 Close-up of a cotton bed sheet. Ultimately, the better bedding fabric is the one that meets your personal needs. Polyester may work better for you if you don't perspire at night and need the warmth the bedding provides. But body lotion, oil and grease stains are not as easy to remove from polyester as they are from cotton fabrics. Cotton fibers are not as strong as polyester ones, so the bedding won't last as long as polyester-based fabrics. If you prefer natural products over man-made, cotton is the best choice. The fibers in cotton are hypoallergenic and don't contain the chemicals associated with the production of polyester. Because it is a natural product, it's easy to dye and washes well on hot water settings; however, the fiber's thinness means that it is not as durable as polyester. Premium cottons used in bedding increase the price substantially, especially when you buy bedding made from expensive extra-long staple Egyptian cottons. 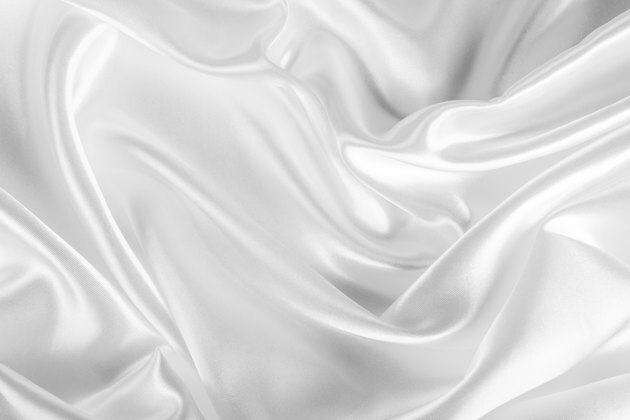 Close-up of a polyester bed sheet. Since polyester is a man-made product, it doesn't cost as much to create the fibers that go into the fabrics, making it a cheaper bedding option than cotton. But polyester traps moisture, and little pills develop on sheet and comforter surfaces with age and wear. And. as the bedding ages, its fibers stiffen, leaving sheets feeling rough to the touch. Stains are also harder to remove from polyester during the wash cycle. A mother and daughter make a bed. When you want the best of both products, choose a polyester-cotton blend for your bedding fabrics. When combined together, you get the breathability of cotton and the strength of polyester in one product that may not be as expensive as those 100 percent Egyptian cotton bedsheets. Higher thread counts produce softer sheets when a sateen weave is used in cotton-polyester bedding. For cool, crisp sheets, choose a cotton-polyester blend in a percale weave.